Optional Inkscape SVG editor with JessyInk plugin. 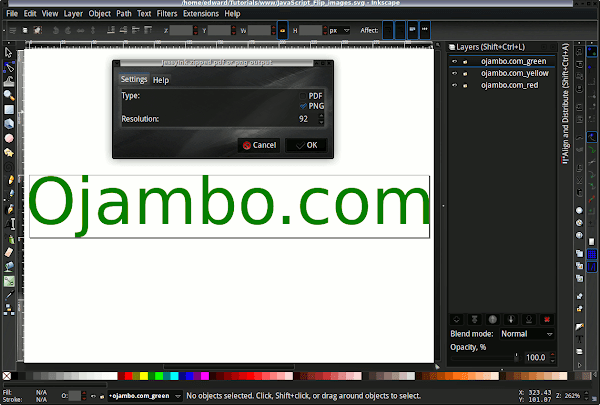 Optional Gimp bitmap editor with Web Save plugin. Inkscape is required in order to follow this part of the tutorial. For more information about Inkscape JessyInk plugin read Ojambo.com Layered Inkscape SVG Layers Into Bitmaps Using JessyInk. File -> Document Properties -> Custom size. Create image 320px x 50px. Create and edit text objects tool -> Ojambo.com in red. Gimp is required in order to follow this part of the tutorial. For more information about Gimp Save for Web plugin read Ojambo.com Gimp Save Images For Web. File -> Open -> Image file. File -> Save for Web. Select best compression and quality size. Save -> Input new name for file. Geany is required in order to follow this tutorial. For more information about Geany read Ojambo.com Lightweight Programming Editors. Project -> New -> Name = ojambo_flip_images, Base path = /project/flip_images. The Geany default base path is the current project path. Observe as the first three images are flipped. After the third image, you should see the first image. The process will repeat until the browser window is closed or you navigate away. A flip effect is created by changing the image displayed in a specific page area. The onload method can be applied to the body HTML tag to start the flip effect when the page is loaded. Create as specific DOM object for the images. Save images for the web so that the load times are shorter. Ojambo.com Layered Inkscape SVG Layers Into Bitmaps Using JessyInk. Ojambo.com Gimp Save Images For Web. This entry was posted on Wednesday, September 11th, 2013 at 12:00 am	and is filed under Tips & Tricks. You can follow any responses to this entry through the RSS 2.0 feed. You can leave a response, or trackback from your own site.